Summer Reunions are the best! Love getting back in touch with family and old friends. Take it from me, nothing like a Mexican Fiesta for summer reunions!! They are casual relaxed gatherings that are full of fun! Everyone will love the food and of course the drinks 🙂 You can go simple: prepare the food and place it all on a central table and your guests can munch away as they mingle throughout the night. Or you can go all out with a themed party, choosing vibrant colourful linen, topped with themed or colourful flatware. Bring out those coloured glasses, Have cactus pots all around, Sombreros, shakers and margarita pitchers as centre pieces. 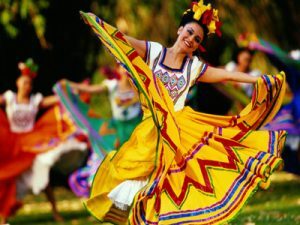 You can even hire Mexican performers to play music and dance. This party will be the talk of the town for a long time! And boy will everyone back home be happy that you are back! Mexican Fiestas are really so much good fun! When it comes to Mexican food, there are many preparations that are famous around the whole the world! There is an abundance of choice, and it is up to you whether you want to go for the classics making sure everyone enjoys or go with the less known and more experimental options and allow your guests to explore the new. However way you go, Mexican food is created for parties and will be easy to make and fun to serve any how. Just note that Mexican food can be a bit spicy, especially for those who are not used to chillies and spicy food. The best hosts are those who think of everyone, and for that it is best to prepare 2 versions of spicy foods. One spicy as it should be and another milder version for those who do not like spicy. It is this attention to details that sets you apart as a hostess and ensures all your guests are happy. I have chosen the most famous Mexican recipes to include in this post, as these are the recipes that come in handy for home entertaining any time. Be it an extravagant Mexican Fiesta or just a gathering at home with friends, these are recipes that make entertaining very simple and a lot of fun and are the ones I am always requested to post. Whenever I want to whip up something quick for my girls’ night, or when my hubby and I decide on a last minute get together, these are the platters I go for. Try them out you will love them. For the health conscious, you do not have to break your diet for this night. Guacamole and tomato salsa are essentially vegetables. It is like having a salad, just in small bites. Pair that with toasted Low-fat / Low-carb tortillas and you are seriously not harming your diet. Avocados are very healthy and so are tomatoes, which are full of antioxidants. Take it easy on the Margaritas and you are doing well. What can be better? A little something before I go… Don’t you just love this idea! The Watermelon Keg!! This looks like fun and tasty party food! Yum!